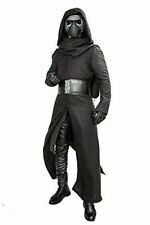 Adult Kylo Ren Star Wars Halloween Costume Men's extra large XL. Condition is Pre-owned. Shipped with USPS Priority Mail. This tunic was made before the crl for the last jedi came out. Made of heavy material, with the 0.8 squares quilted squares. It has it's shoulder caps at the shoulders, gold thread, and piping. Made to fit about a size L- XL. Can provide more pictures upon request. It has never been worn. It's not up to 501st standards, but can be used for a convention cosplay or just for fun. Thanks for looking. Black body robe has solid under-layer that ends just above the knee, scarf like outer layers end at ankles. Total Robe Length 59". Hard plastic face mask w/ elastic security band and openings for eyes and nose. Care and Cleaning: Spot or wipe clean. 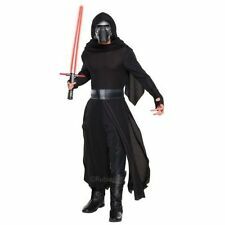 Full Set Kylo Ren Costume for SALE,Only a few amount! 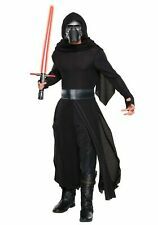 Nearly new Kylo Ren adult deluxe costume. Bought last year and only worn a few times. Excellent condition and comes with all original pieces. However, original costume does not include pants, boots, or light saber. Those must be supplied separately. This includes Rubies 820211 Kylo Ren. Kylo Ren Light Saber. Kylo Ren Tunic 501st Approved. CRL compliant. Would best best for someone around 5'7 or 5'6 as this was too short for me (5'10). Has been worn once. The tunic is made of black lightweight fabric with minimal sheen. It's pintucked with squares approximately 0.8 Inch. Tunic is padded and has Charcoal grey shoulder caps. The military collar is closed and is Sewn with bronze/dark gold thread. The hidden zipper in the center of the tunic and ends under the belt. Here’s the measurements that would be best: Neck: 14-14.5” Chest: 40” Waist: 30” Shoulders: 18” Shipped with USPS First Class Package. These two pieces would be a great start to a Kylo ren cosplay! Any modifications that you may need are on you. Never been worn other than to try them on. The two pieces are the tunic and mid coat. The best Kylo ren buckle replica. All details have been carved by hand from aluminum, then painted textured, then cast to get black resin copies. Worn beneath the outer robe. Made from black wool (or wool-like material). Made from a black twill natural fiber (ex: wool, rayon or cotton) with an irregular distressed pattern. Full front zip. Detachable cape. Side pockets. ACGcosplay Real Object Photography,Real Shot Pictures. Include wide belt. When you place order. "Together, we will destroy the Resistance and the last Jedi.". ---Kylo Ren. Designed by Xcoser. "Together, we will destroy the Resistance and the last Jedi.". ---Kylo Ren. Designed by Xcoser. Inspired by SW: The Force Awakens. Material: High Quality Linen fabric Faux suede PU. What I am auctioning today is a nearly brand- new custom made Kyle Ren cosplay costume. This model I believe to be quite rare considering it is no longer made by Xcoser. Only worn twice for pictures and makes a great costume for Halloween or comic con events. If you are interested in purchasing the Black Series mask to go with this costume, you can find that on my page on a separate listing. Excellent condition, medium size. If you have any questions feel free to ask!